Shortened to 'Tana' and surrounded by wilderness, Antananarivo is the bustling capital of Madagascar. 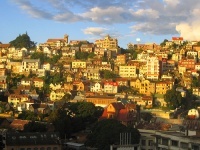 Built on hillsides and ridges, Tana is the main entry point for visitors travelling to Madagascar. With a distinctive French flavour, red-brick houses and nineteenth-century churches are dotted around the maze of small, winding streets, Tana has its own inimitable charm and is an attraction in itself. Sights worth seeing include the Royal Hill of Ambohimanga, the Prime Minister's Palace and Rova, and the old shell of the Queen's Palace. Meaning 'town of a thousand', Tana was named for the revered 17th-century King Andrianjaka who conquered several villages in the area, leaving a garrison of 1,000 men to defend his new territory. Shopping in Antananarivo is a unique experience with stores, bustling markets, shopping centres, and hawkers vying for patronage. The Zoma Market, held daily, was once claimed to be the second-largest in the world, and is definitely worth a visit for those searching for souvenirs. Tana Market is also popular and sells exquisite local handicrafts and artefacts made of sea shells and corals. Head to the Avenue of Independence for some fantastic stalls where popular Madagascar souvenirs such as woodcarvings, oil paintings, hand-loomed fabrics, cotton, silk, embroidery, and woven straw hats can be found. Haggling is expected but, as a tourist, be prepared to pay more for items than locals. Beware of pickpockets in the bustling markets, and brush up on your French as this can come in handy when bartering with the locals. Visitors should be on guard against opportunistic crime as poverty levels are high in the city.